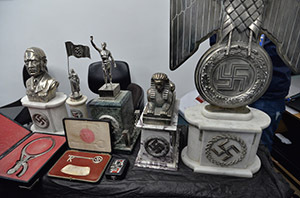 BUENOS AIRES, Argentina (JTA) – A cache of 75 original Nazi objects discovered in June by the Argentine Federal Police has been evaluated as “unprecedented” and “the biggest” discovery of its type. The objects, discovered earlier this month in a hidden room of a house in the northern part of Buenos Aires included equipment used for Nazi medical experiments during the Holocaust. They were at Interpol headquarters in Lyon, France, Federal Police Commissioner Marcelo El Haibe told JTA. The police found a bust relief of Adolf Hitler, medical devices marked with swastikas used to measure head and body size, Nazi puzzles for children and knives, among other objects. Among the objects discovered was a magnifying glass attached to a photo of Hitler using the magnifying glass. According to El Haibe, who also serves as the chief of the Protection of Cultural Heritage department of the federal police, only a very high level of Nazi officer had access to this quality and quantity of objects, and apparently tried to save the objects when the Nazi regime was failing. The Argentine Jewish political umbrella DAIA displayed some of the objects at its headquarters in the AMIA Jewish center here. The AMIA building was destroyed in a 1994 terrorist bombing and rebuilt in 1999. DAIA President Ariel Cohen Sabban praised the police for making the discovery. 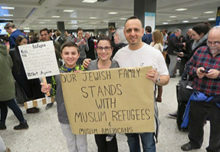 Among the attendees were Germany Embassy officials, judges, intellectuals and businessmen, as well as the Jewish philanthropists Eduardo Elsztain and Marcelo Mindlin, who was named recently the president of the Holocaust Museum of Buenos Aires. “This collection is a great responsibility; we will prepare our site to receive this contribution,” Mindlin told JTA. “There will be a lot of fanatics that will want to enter, there will be people trying to steal objects,” he added, noting that “huge security issues” must be worked out. In June 2016, a collector from Argentina paid $680,000 for a pair of Nazi-owned underpants and other memorabilia. The magnifying glass and accompanying photo of Hitler were not put on public display, but Indij saw them at Interpol headquarters and confirmed their existence to JTA. Mengele, a doctor who performed experiments on Jewish prisoners, lived in Argentina for a decade after the war in the same area of Buenos Aires where the Nazi medical tools were discovered. El Haibe said there could be some link between Mengele and the recently discovered tools. Argentina was a refuge for Nazis like Mengele after World War II. 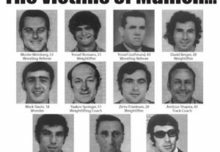 Adolf Eichmann was captured in the northern area of Buenos Aires in 1960, and another war criminal, Erich Priebke, also lived there. A video about the Interpol evaluation, dubbed Operation Near East since many objects of Asian historical significance also were discovered during the raids was released by the Argentine Federal Police. The objects were found June 9 following a nine-month police investigation. They are in the custody of the justice who is tasked with investigating the find, who has put a gag order on most aspects of the case.